Dehydration of elderly patients can lead to wrongful death. Water is the most essential component of life. Proper hydration is paramount over all other human needs. A human can go weeks without food but will die in 2-3 days without water. Water is used in every single human organ function, including controlling body temperature, processing food, expelling waste, and promoting brain function. Needless to say, adequate water levels are required for the body to function. Proper fluid intake is even more important in the vulnerable elderly patient population that live in our nursing homes. Inadequate fluid levels is known as dehydration. Dehydration occurs if the fluid output of the body is greater than the fluid intake. Water and other fluids are excreted through urine, skin, blood and the lungs. Water excretion must be monitored by the nurses to ensure that the resident's fluid levels stay within normal range. In addition to water loss, dehydrated individuals suffer from low potassium and minerals, which greatly impacts the body's ability to function. Simply put, without water, an elderly patient cannot and will not survive. This leads to dehydration wrongful death lawsuits. Nursing home residents pose a higher risk of dehydration. Because most folks in nursing homes are elderly, they have a much lower fluid level than that of a healthy young person. This means that older, more frail nursing home residents can become dehydrated that much quicker. Many nursing home residents are unable to voice their needs. Some suffer from Alzheimer's disease or dementia. This means it is the nursing home's duty to make sure the resident is getting enough water. 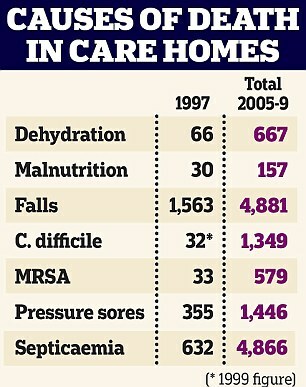 Dehydration in nursing homes is unacceptable. Dehydration in elderly patients can result in rapid weight loss, a worsening of preexisting conditions, pressure ulcers and even death. IV hydration therapy can be used in nursing home residents with severe dehydration. Nursing home dehydration rates are rampant. More than 60% of residents have water (hydration) intakes under 1,500 cc per day. The Mayo Clinic recommends between 1,500 to 2,000 cc of fluid intake per day, which means that this statistic is unacceptable. Dehydration and malnutrition effects an estimated 45% of all nursing home residents in America. A medical research article reports that more than half of all seniors in long term care facilities are underweight. So why is this such a problem? Many nursing home patients are unable to hydrate themselves. They are dependent on staff for tradition hydration (water via a glass) or IV fluid supplements and tube feedings. This means it is the duty of the nursing home staff to monitor fluid input and output, as well as monitoring the resident for signs of dehydration. Understaffing: Providing a nursing home with too few staff members to operate effectively. Why can't we put an end to dehydration in vulnerable nursing home patients? To put it simply; there are not enough staff attending to the residents at most nursing homes. By American nursing home standards, a CNA averages 8 'high risk' nursing home residents during the day shift, and 14 residents during the night shift. Many, if not most of these residents cannot hydrate themselves. There is also commonly a language barrier, with many nursing home staff unable to speak fluent English. Staff get minimal training, long hours and little rewards. Studies put the CNA nursing home turnover rate above 90%. This creates a revolving door of new people who do not know the intricacies of each patient's care needs. These are symptoms of nursing home dehydration. Skin breakdown. Test the skin turgor of your family member by pulling up the skin on the back of their hand and seeing how long it takes for it to return to its normal state. Enlarged, discolored or abnormally dry tongue and/or mouth. Increase in pulse with a decrease in blood pressure. Low, dark colored urine output. Inability of staff and patients to communicate. Dehydration results in vital organ shut down and can even lead to wrongful death. If your loved one was wrongfully injured or killed in a nursing home due to dehydration, you have our sincerest condolences. Know that you are not alone. Millions of nursing home residents die each year due to dehydration, even though it is generally preventable. If you believe your loved one may have been neglected, take a stand. First, report the wrongful dehydration death to your state's department of health and elder abuse hotline. If you are unable to find the proper reporting agency, contact us and we can help you. Once you have reported the incident, speak with our nursing home dehydration lawyers about taking action now. Don't let the abuse go unreported. Make sure this type of preventable tragedy does not happen to someone else. Call us today at 561.316.7207 for a free case evaluation. We are happy to discuss your options moving forward. Do I Have a Dehydration Case?